What is Your LinkedIn Strategy? 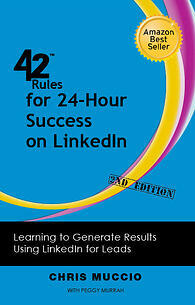 The following is an excerpt from our book on LinkedIn, 42 Rules for 24 Hour Success on LinkedIn. Let's start with a simple fact. LinkedIn is a platform. You probably use other business platforms for things such as accounting, HR, and payroll. Do you simply turn those platforms on and expect them to generate the benefits you are looking for? Most likely not. You start with a strategy and build the platform to accomplish that strategy. With certain platforms, you may even invest hundreds of thousands of dollars to have consultants set it up effectively for you. Now think of LinkedIn. How many of us take the same approach to our use on this tool? You need to set your business goals and strategy. Simply being on LinkedIn is not a business strategy. Your goals should drive your entire presence. #1. 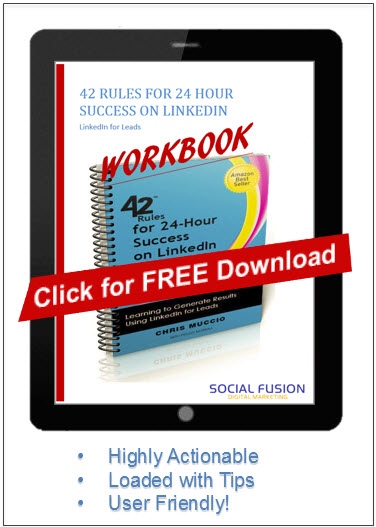 Determine if LinkedIn is a good fit for your business. Businesses that offer products or services for other businesses tend to do well by leveraging LinkedIn. Build leads and nurture relationships. LinkedIn offers a neat little function that shows, at a glance, what you and another LinkedIn member have in common. Finding new talent to hire, partner, or contract with. This site is great for hiring people. Using it as a tool for learning. You can gain a great education through reading key articles that others post. Build a virtual rolodex of business partners and people you network with. You can use LinkedIn to find people. You can search for those in a particular industry, location, or company quite easily. It is a great forum for connecting to those in your target market. Demonstrate your credibility and experience. As you will read in some of our other rules, this is key for people in terms of generating results. A tool to keep communications flowing. Sometimes, it is hard to keep up a verbal conversation with a partner or prospect. LinkedIn offers simple, nonintrusive ways to keep the communication flowing. Identify key decision-makers and prospect for account entry points. Look for ways to generate warm introductions based on your network. For companies you are looking to prospect with, look for connections or contacts within your network that can be connected to them. Our suggestions are merely a drop in the bucket. Depending on your use of LinkedIn, there are many more ways that you can, and will, tap into. Remember, the only limit to one’s vision is one’s vision. #3: Understand the steps that make a lead generation process work well. Start with a strategy. Build a great personal profile. Create awareness. Be consistently visible, and stay top of mind. Engage your network. Share interesting, valuable, helpful content with your network. Convert. Trust is created, and people tend to do business with those they trust. In our LinkedIn methodology, we advocate you start by strategizing. This defines your overall business path to connect and grow with your target audience. Don’t let this concept overwhelm you. It’s about having a focus and a purpose when you use LinkedIn that aligns with your business. Think of it like this: If you want to travel from point A to point B, you can clearly define your route. Conversely, if you don’t know where you want to travel too, you are probably going to simply wander endlessly and not get anywhere, which is unfortunately the fate of many millions of LinkedIn users.